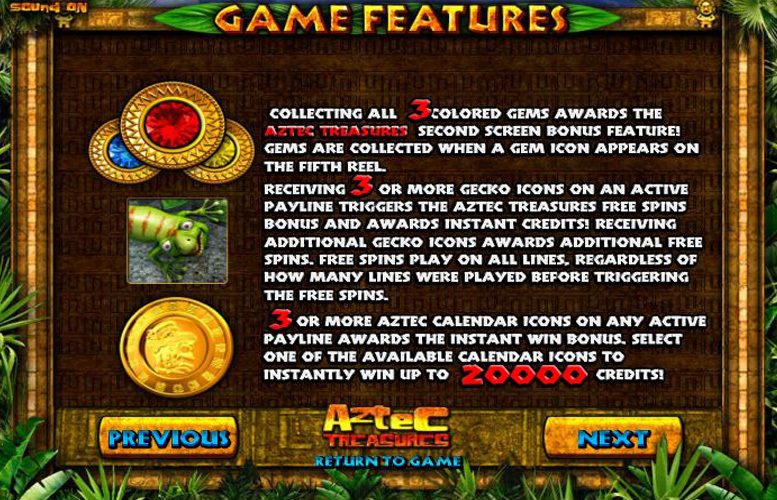 The Aztec Treasures slot machine from Betsoft is a solid title that offers players a good mix of bonus features whilst remaining strong visually. The theme might be a little abstract, and the chief of the tribe probably isn’t the best representative of women’s rights ever but this hardly detracts from the enjoyment that can be gleaned from the game. In terms of specifics, the game is played over a standard board of five reels and three rows. There’s a free spin mode, along with some novel “wild” symbols, and a few other little features too. All told, it’s a decent game, although nothing really stands out and thus it can’t compete with our highest rated machines. Visually appealing. Being a game by BetSoft, you just know that Aztec Treasures is going to be a looker. Its backgrounds, symbols, and animations have been exquisitely designed. Innovative bonus features. There’s a great variety between the various bonuses on offer in Aztec Treasures. Fans of the title will likely find something to enjoy on multiple return visits. Low upper betting limit. 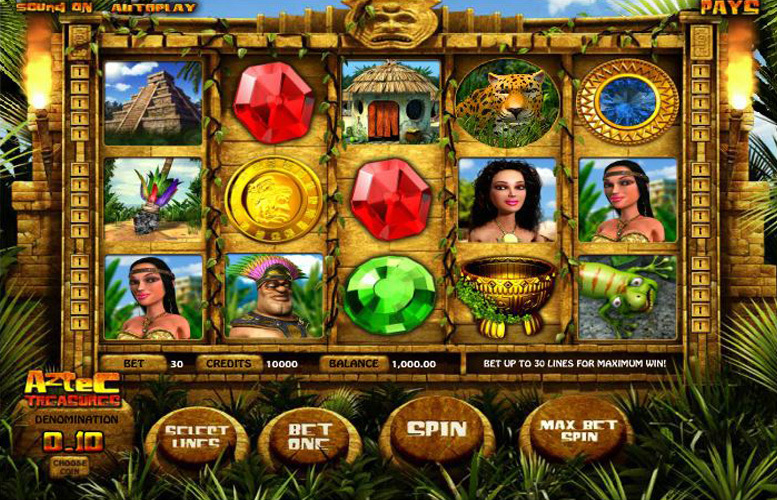 As with most BetSoft offerings, players can only bet up to £150 on Aztec Treasures. This will be plenty for most but those wishing to seriously splash the cash are best advised to look elsewhere. Low main game prizes. Many games these days offer impressive five-figure jackpots for hitting five-of-a-kind of their highest value symbols. Aztec Treasures’s 300x the line bet is pitifully small in comparison. Chief = 300x line bet. Woman with headband or necklace = 200x the line bet. Cheetah = 150x line bet. However 3 of the special Aztec calendar symbols can win you 20,000 coins. 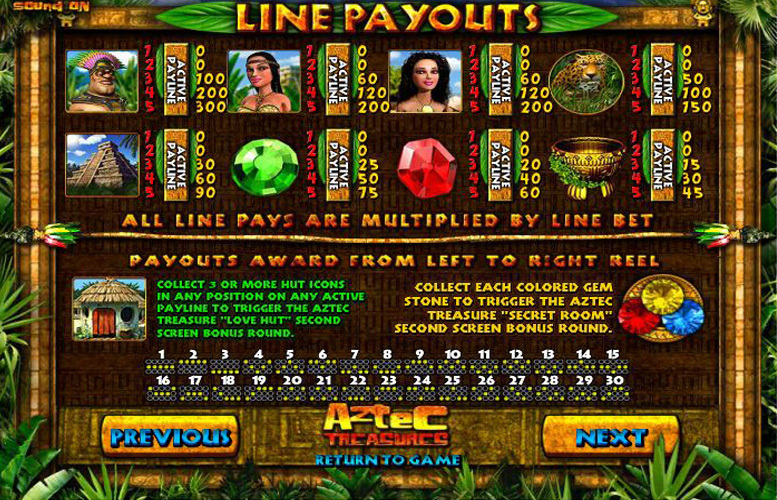 Landing three or more hut symbols in any position on an active pay line and players will trigger the Aztec Treasures “Love Hut” Second Screen Bonus Round. Players who can collect each of the three coloured gem stones will trigger the Aztec Treasure “Secret Room” Second Screen Bonus Round. To collect gems, they must appear anywhere on the fifth reels. Landing three or more gecko symbols across an active pay line will trigger the Aztec Treasure Free Spins Bonus, as well as instant credits. Players who land additional gecko icons will receive extra free spins. These play on all lines, regardless of how many lines were active before triggering the free spins. Landing three or more Aztec Calendar icons on any active pay line awards the instant win bonus. Select one of the available calendar icons to instantly win up to 20,000 credits. Landing both women icons either side of the chief on reels two, three, and four and lines one, two, or, three to receive the “Kiss Me” Wild Reels feature. Landing one or more spear symbols in any position on any reel will turn another icon on the screen “wild” instantly. Temple = 90x the line bet. Green gem = 75x line bet. Red gem = 60x line bet. Golden bowl = 45x line bet. 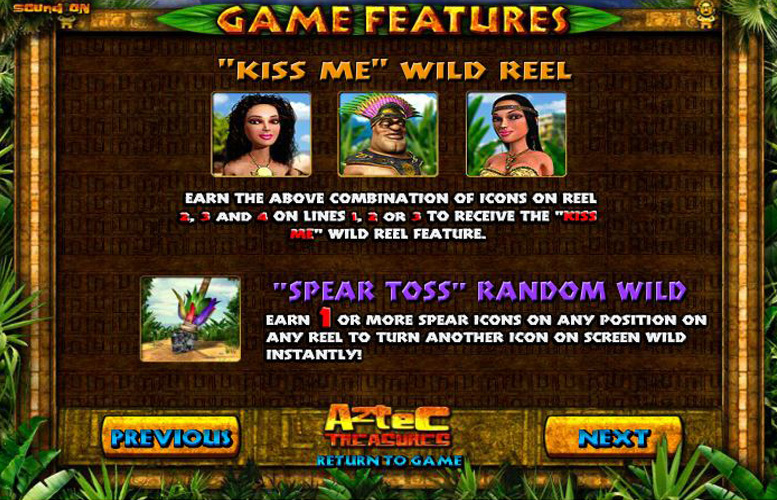 Players are given ultimate control over how they distribute their bets on Aztec Treasures. They can choose how many win lines they play (between one and 30), and how many coins they bet on each (between one and five). As well, they can adjust the value of each coin. The lowest here is 2p, and the highest is £1. This means that with all the values set the lowest, the minimum bet per spin is just 2p. Meanwhile, if all variables are maxed out, the largest possible bet per spin is £150. Many players will consider this plenty for a good session but there do exist high rollers who will find this maximum a little too restrictive. They’re better advised to look at different slot manufacturers since most machines by BetSoft suffer similarly. BetSoft use strong visuals and solid gameplay dynamics on Aztec Treasures to deliver a package that is enjoyable on multiple visits. The background, symbol artwork, and animation have all been lovingly designed, and the tribal soundtrack with noises from the jungle create a suitable atmosphere. A wealth of special features help to keep the action fresh, and it’s easy to imagine this game being a popular part of BetSoft’s catalogue. That said, it does suffer from some of the designer’s frequent pitfalls. If only they’d make a game where you can bet £1,000+ per spin. We’d probably be able to start giving some perfect scores out! This game has a rating of 4 / 5 with 673 total reviews by the users.